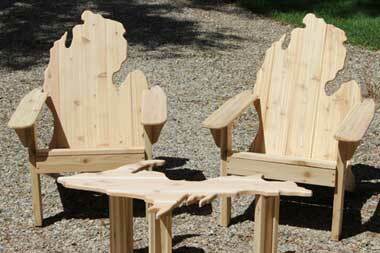 This Michigan Outdoor Furniture Set includes two Michigan Adirondack Chairs and a Michigan UP Table made of Knotty White Pine or Western Red Cedar. Please allow 7 to 10 days as each piece is made to order. Assembly is required. Each piece comes in a kit with complete with precision cut, sanded and pre-drilled pieces, easy to follow instructions and all necessary hardware for assembly procedure. All are encased in tight fitting, fully labeled cartons. The Michigan UP Table measures 47″L x 27 1/2″W x 17 3/4″H.